Get outstanding image accuracy, exceptional adjustability, and mission-critical reliability optimized for commercial environments. 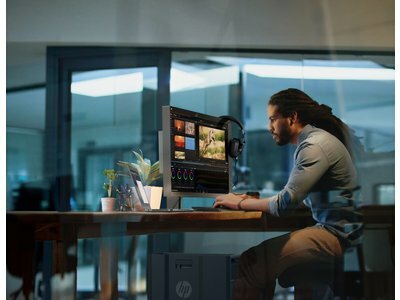 Built with IPS Gen 2 panels, the HP Z30i 30-inch IPS Display delivers power savings over first-generation IPS technology and extra-wide viewing angles that foster collaboration. 17.7" x 27.2" x 2.6"
Lower your power consumption1 and get 100% coverage of sRGB color spaces and 99% coverage of Adobe RGB color spaces from IPS Gen 2 panels. Find your most comfortable position with an HP-exclusive 4-way adjustable stand and an integrated HP QR2 Quick Release that enables VESA mounting. Enjoy future-ready and legacy connectivity from a range of inputs that include DisplayPort 1.2, DVI, VGA, HDMI 1.4, audio output for an HP Speaker Bar,2 and four USB 3.0 ports with speeds up to 10x faster than USB 2.0. Get organized with the integrated cable management clip. Create a clean, compact all-in-one with the optional HP Thin Client Mount Kit2. The HP QR2 Quick Release is integrated into the display to enable quick set up, and it’s VESA mountable. Optional Care Pack Services are extended service contracts which go beyond your standard warranties. 1 Comparison is to IPS Gen 1 panels. 2 Options sold separately. Thin client sold separately. Thin client kit expected availability September 2013.